If your school garden lacks space, or if there are lots of competing demands on it, small scale school gardening can be important. 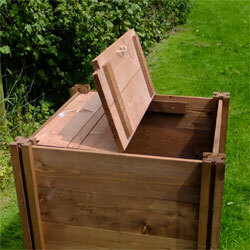 The Compact Wooden Compost Bin is perfect for composting in a smaller space. Measuring 60cm by 60cm but 75cm tall, it will easily fit into a small corner, but is large enough to make a good amount of compost. For a limited period only, take advantage of this Compact Wooden Compost Bin Value Bundle. Included are the compost bin, a wooden lid, a composting pitchfork and a bottle of compost magic. Click here for all the details.